"Apparently, “Azikanapo!” is Abenaki for “It snows foot wrappers!,” a descriptor of very large snow flakes. It would seem that Joe and Jesse worked carefully with the illustrator to make sure the cultural details were accurate. And each of their other children’s books published by Dial, How Chipmunk Got His Stripes (2001), Raccoon’s Last Race (2004), and Turtle’s Race with Beaver (2003), contains an author’s note that sets the story in the context of source, time, place, language and culture, something that Joe is always careful to disclose. In my workshops, I’ve stressed the importance of knowing the source and the other attributes of a story, so it puzzles me that this information was left out of Rabbit’s Snow Dance." 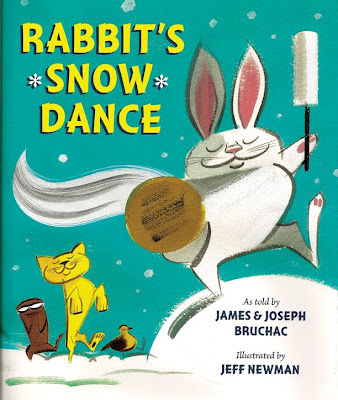 "The front matter labels the story as a “traditional Iroquois story, and the description (written by the publisher) says that Rabbit uses “a traditional drum and song, to make it snow”—yet the word is an Abenaki expression, not “Iroquois.” And I may be wrong, but “I will make it snow” does not sound like a traditional song, either. It sounds like something Rabbit might sing, but it doesn’t sound “traditional,” which may be the point of the story. Just a guess." Thanks so much for posting this! I am a children's librarian at a public library, and I was looking for those notes, too. This book is delightful! I immediately brought it home for my kids, who are "too old" for picture books now but still are happy to curl up with a good one when I bring it home. They both loved the humor in this one.